Scientists trying to understand what is toxic about the C9ORF72 hexanucleotide expansion, linked to amyotrophic lateral sclerosis and frontotemporal dementia, have implicated two different RNA repeats and five different dipeptide-repeat proteins as potential culprits. In the March 21 Nature Neuroscience online, researchers focus on one of the peptide repeats, poly-glycine-alanine. 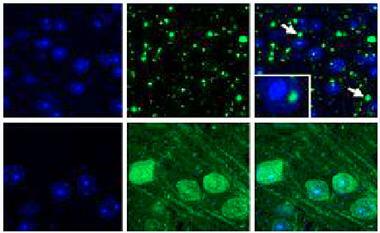 When expressed in mouse brain, poly(GA) interfered with protein degradation and nucleocytoplasmic transport, report senior author Leonard Petrucelli and colleagues at the Mayo Clinic in Jacksonville, Florida. Poly(GA) aggregates sequestered HR23 proteins, which transport nuclear proteins to the proteasome for degradation. However, the mice were notably free of a major feature of typical C9ORF72 pathology, i.e., the TDP-43 inclusions. The results imply that while poly(GA) clearly contributes to ALS and FTD, it must work with other players to create the full spectrum of neuropathology. The GGGGCC expansions in the C9ORF72 gene are transcribed in both sense- and antisense directions. Messenger RNAs are then translated into five different polypeptides (two of the six possible reading frames both encode poly-glycine-proline). Some studies suggest the RNAs cause neurodegeneration (see Feb 2016 news; May 2015 news; Oct 2013 news). Others point an accusing finger at the repeat dipeptides, particularly the poly-glycine-arginine and poly-proline-arginine versions. Perhaps that is because arginines target the peptides to the nucleolus, where they prevent normal RNA production (see Aug 2014 news; news;Dec 2014 news). And yet some studies find that poly(GA), not its arginine-rich counterparts, is among the most abundant repeat dipeptides in the brains of C9ORF72 expansion carriers (see Feb 2013 news; Mackenzie et al., 2015). Petrucelli’s group and others have found that poly(GA) makes neurotoxic inclusions in cultured neurons. It co-aggregates with ubiquitin and p62, disrupting proteasome activity (Yamakawa et al., 2015; Zhang et al., 2014). In the current study, first author Yong-Jie Zhang and colleagues tested whether it would also be neurotoxic in vivo. The authors designed a transgene that encodes poly(GA) without the repetitive RNA sequences. They packaged it in adeno-associated virus and injected it into the brains of newborn mouse pups, then analyzed them six months later. As a control, the authors made an interrupted poly(GA) gene, with a proline inserted after every fifth GA repeat. Both constructs were expressed at similar levels in the mice. In the neurons of the cortex and many other regions of the animals’ brains, poly(GA) formed cytoplasmic, and occasionally nuclear, inclusions. Most of these contained ubiquitin as well. The interrupted poly(GA) construct did not aggregate. Only aggregation-capable poly(GA) was neurotoxic. The brains of mice expressing poly(GA) weighed about one-third less than those that received the interrupted gene or a control construct with only green fluorescent protein (GFP). 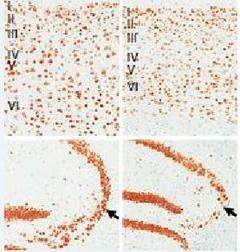 The poly(GA) mouse brains contained fewer neurons in the cortex, hippocampus, and cerebellum (see image above). Poly(GA) mice also had behavioral abnormalities. They fell off a rotating rod sooner than controls, indicating motor neuron defects, and had trouble learning to associate white noise with a foot shock. Petrucelli said he is not sure if the large poly(GA) aggregates are the toxic species, or if smaller species such as oligomers do the real damage. Whatever their size, how did poly(GA) peptides cause neurodegeneration? The authors knew from the cell-culture studies that it interfered with the proteasome but were unsure how. In a previous study, scientists had found that poly(GA) bound to HR23A and HR23B, which ferry ubiquitinated proteins from the nucleus to the proteasome (May et al., 2014). Zhang and colleagues suspected that poly(GA) might interfere with this process. While HR23 proteins are normally diffuse in the nucleus, in the brains of poly(GA) mice they aggregated in the cytoplasm and nuclei. Moreover, these aggregates included poly(GA), suggesting the repeat dipeptide sequestered the nuclear HR23 proteins. HR23 proteins also co-aggregated with poly(GA) in hippocampal sections from people who died of FTD or ALS due to the C9ORF72 expansion (see image at right). This raised the question of how the nuclear HR23 proteins mislocalize to the cytoplasm. Other researchers have reported that cytoplasmic aggregates interfere with nucleocytoplasmic transport (see Dec 2015 news) and C9ORF72 expansions, in particular, seem to block traffic between the two cellular compartments (see Aug 2015 news). Nucleocytoplasmic transport also appeared defective in the poly(GA) mice; both the traffic regulator RanGAP1 and the nuclear pore component Pom121 wound up in poly(GA) inclusions. In addition to recruiting HR23s directly into aggregates, poly(GA) may cause some nuclear pore defect that contributes to HR23 mislocalization, suggested the authors. To check whether poly(GA) interfered with HR23 function, the authors examined the DNA damage repair protein XPC (xeroderma pigmentosum C). Normally, HR23 proteins stabilize XPC and protect it from degradation. In the poly(GA) mice, XPC levels were half that of controls, indicating HR23 was not working. If loss of HR23 function caused the toxicity in the mouse brains, Zhang and colleagues reasoned, then adding more HR23 might rescue the neurons. Because HR23B can compensate for lack of either HR23A or B, Zhang expressed it in primary neurons along with poly(GA). 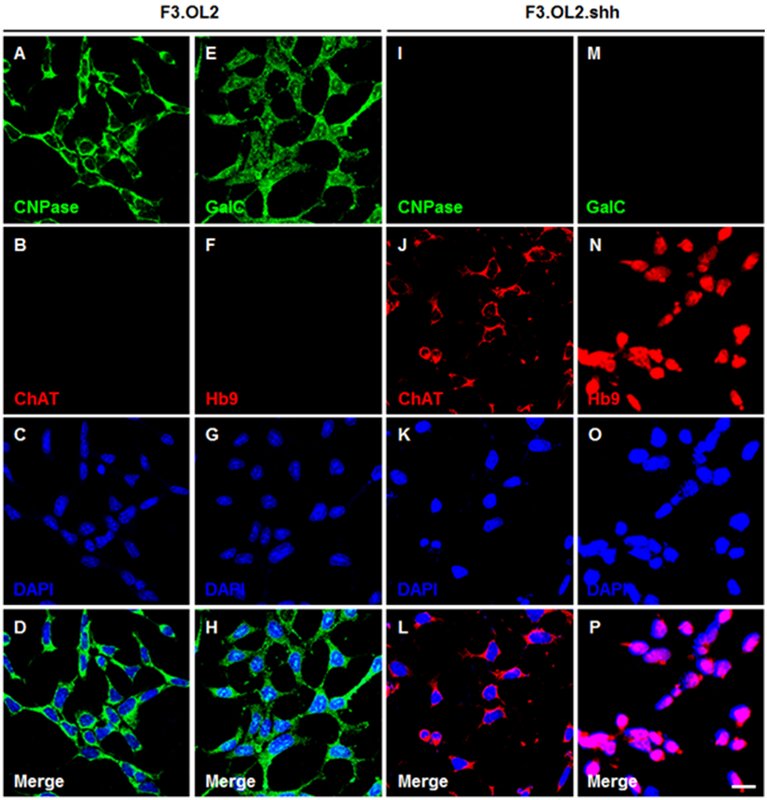 This returned XPC levels to normal and decreased caspase-3 activation, which was associated with neurotoxicity in the poly(GA) neurons. Extra HR23B also reduced the aggregation of poly(GA). Though the scientists are unsure how, Petrucelli speculated it might assist the beleaguered proteasome system, preventing aggregation or dissolving the inclusions. This paper confirms HR23 proteins as players in C9ORF72-based disease, commented Brian Freibaum of St. Jude Children’s Research Hospital in Memphis, Tennessee, who did not participate in the work. HR23A and B also aggregate in neurons of people with Huntington’s disease, spinocerebellar ataxia, and fragile X-associated tremor/ataxia syndrome. Despite the neurodegeneration in the poly(GA) mice, they conspicuously lacked one major feature of C9ORF72-based disease, that is, cytoplasmic TDP-43 inclusions. Other C9ORF72 dipeptides might precipitate those inclusions, Petrucelli suggested. “It will be of great interest to determine if that is true,” said Adrian Isaacs of University College London, who was not involved in the paper. Petrucelli is working on other dipeptide repeat mice, with poly(PR) next in line, he said. “The confirmation of poly(GA) toxicity in mice is an important step forward and will no doubt further fuel the current debate around the toxic species in C9FTD/ALS,” Isaacs said. “While these new data show poly(GA) can be toxic, they do not clarify which species is ultimately the toxic one in patients,” he cautioned. Zhang YJ, Gendron TF, Grima JC, Sasaguri H, Jansen-West K, Xu YF, Katzman RB, Gass J, Murray ME, Shinohara M, Lin WL, Garrett A, Stankowski JN, Daughrity L, Tong J, Perkerson EA, Yue M, Chew J, Castanedes-Casey M, Kurti A, Wang ZS, Liesinger AM, Baker JD, Jiang J, Lagier-Tourenne C, Edbauer D, Cleveland DW, Rademakers R, Boylan KB, Bu G, Link CD, Dickey CA, Rothstein JD, Dickson DW, Fryer JD, Petrucelli L. C9ORF72 poly(GA) aggregates sequester and impair HR23 and nucleocytoplasmic transport proteins. Nat Neurosci. 2016 Mar 21. [PubMed].